Enter for a chance to win both of these prizes 2014! 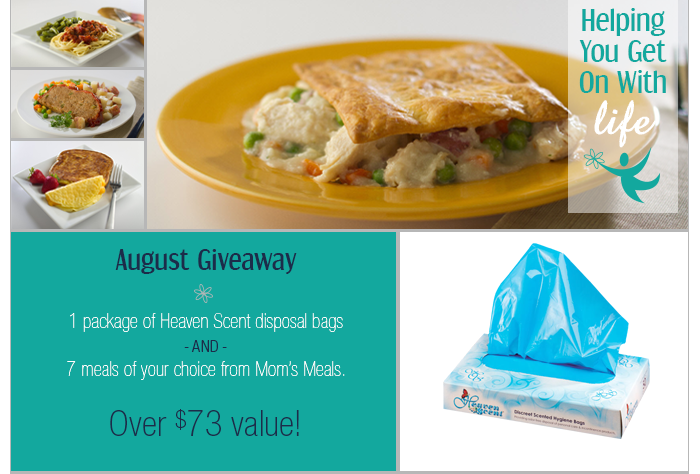 This month’s prize bundle includes seven choices from Mom’s Meals home-delivered food service and a package of versatile Heaven Scent scented disposable bags. Hunger and malnutrition are very real problems for America’s seniors. Among the many causes of malnutrition, including financial limitations, medications and depression, physical problems also limit seniors’ ability to shop for and prepare meals. There are a variety of programs to help seniors get proper nutrition. Those who don’t qualify for federal or state nutrition programs should consider a service like Mom’s Meals. • Seven meal choices from Mom’s Meals, with free doorstep delivery. Mom’s Meals delivers nutritionally balanced, freshly prepared meals to customers’ homes. Designed to meet the needs of our aging population, each meal contains fresh foods, is microwaveable and will keep in the refrigerator for two weeks. Mom’s Meals offers 45 unique meal choices, including specialty choices like low-sodium, low-fat, gluten-free and more. • Heaven Scent premium scented bags. Designed for the discreet disposal of incontinence, feminine hygiene or baby products, Heaven Scent bags feature a powder scent to mask unpleasant odors and an opaque design to hide contents. Ideal for carrying in a purse, pocket or carry-on bag, package contains 50 each. For a chance to win this month’s prize package, e-mail us at info@caregiverpartnership.com or mail a short statement explaining why the prize would be useful to you or a loved one. We will accept entries for this prize through Aug. 31, 2014, and will notify the drawing winner the first week of September. We created the “Get Back Into Life” monthly sweepstakes to raise awareness of products and services that help seniors live independently and make caregivers’ jobs easier. Prizes to be given away through the remainder of 2014 include TriDerma skin care packages, Stander Metro walker, Prevail premium washcloths and pull-on underwear, TENA flushable washcloths, a Beam ‘N’ Read light, and a Stander Assist-a-Tray. Look for our exciting prize announcements the first week of every month right here on our blog.